American water pipes originally were made from bored-out logs like this artifact. A copper lined closet, with oak high tank and seat. 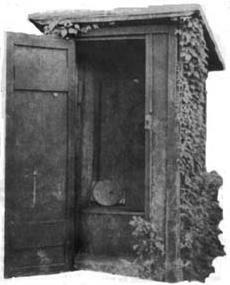 An early 20th century outhouse with a fanciful design. 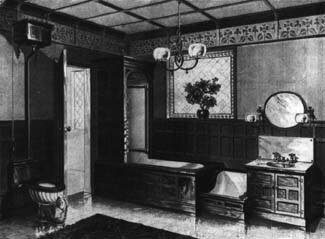 A luxury bathroom of the 1890s would feature wood-encased fixtures in Victorian splendor. An earth closet used indoors used fresh earth or ashes on the bottom of the wood structure to absorb odors. 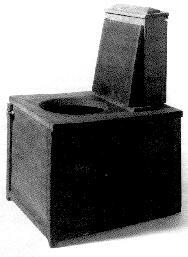 This wooden box encloses a square water closet from early American days. This is such a great overview of the history of plumbing, and takes so many contributing factors into account – many thanks. Hi I have a brass driven ferral i dug up in Philadelphia. On the side of the brass 90. It has #65 imprinted on the side. It goes brass to lead. Journey man plumber wondering what it means. When did copper water pipes become standard in the US? Hi Clint! According to our research, copper tubing was first introduced in American plumbing after World War I, but didn’t really become the standard until the 1960’s. Hello! I’d like to say that this website was fantastic for a great overview of the history of indoor plumbing. Thank you so much for this. Hi! My home was built in 1888. I’m doing a test for lead in my water from the City of Chgo Dept of Water Mgmt and they want to know when the present “water service line” was installed. Upon reading your article (amazing info BTW), I’m guessing the service to my home had to be when it was built. But it’s also mentioning copper pipes, but my son said mine was lead. I’ve already taken my water samples and have only a couple of days for them to pick up the samples. Would you be able to help with this or how can I really find out? Thank you for any help you can give me and sorry for the length of my message. It can be incredibly difficult (or impossible in some cases) to tell when a plumbing system was installed without documentation from the home owner, but you could potentially check into city permits and/or home records to see if any permits or construction/plumbing projects were filed with them. If you have lead pipes we would guess that your plumbing hasn’t been updated since at least the 1960s when copper and plastic pipe started being used more often. From around the late 1800s to that time, galvanized iron pipe was the most commonly used pipe for homes. A lot of people confused lead and galvanized pipe because they can be almost the same color. However, lead pipe will be soft – you can easily scratch it – while galvanized is hard. As a sidenote, if you actually have galvanized pipes, there’s little chance you have lead in your water from the piping, anything they find will have come from a faucet or other fixture that was made prior to the new lead laws. In 1996 detroit Water & Sewerage department did a study and found there were still 800,000 lead service lines in use that were under 3/4″. We still used dry ice to freeze services and installed “Lead Wiped Joints”. I have a section of Tamarack wood that was installed in 1825 in Division Street, between Riopelle and Orleans. We were replacing cast iron mains that had replaced the wood in 1835. This wood was almost 7″ in diameter with a 2″ hole bored through. Former Master Plumber of DWSD. Thank you so much for your much for your information. I am currently writing a family history and wanted to get everything right. Your information helped tremendously. I appreciate the detailed information and attention to detail. Thank you again. Hi! 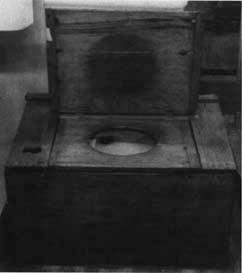 Wondering who was the first inventor of the indoor plumbing system in the united states and how it affected the 5 themes of history: economics, social, political, human environmental interaction and cultural aspects during this time. Not sure there’s really an acknowledged “first inventor” in the US, as the basics of indoor plumbing had been around since the Roman Empire (and even the Egyptians). The article states that Isaiah Rogers designed the first hotel to have indoor plumbing, in Boston in 1829: https://en.wikipedia.org/wiki/Tremont_House_(Boston) – As more hotels and wealthy people adopted the technology, it became more and more popular – eventually, costs came down enough to allow urban middle-class families to have access too. It was a very gradual process. But as something like this shows, it took a while for plumbing to make it to poor and/or rural places: http://www.livinghistoryfarm.org/farminginthe30s/life_13.html – Even today, there are communities that lack indoor plumbing, mostly in remote areas and neglected tribal lands, but also poor neighborhoods in cities. As for affecting the themes of history… that’s a big question. Plumbing and sanitation are vital to a healthy population, which leads to increased economic productivity and different kinds of social interactions, which affects politics. Culturally, just having indoor plumbing was a status symbol, a sign of “success” – these days, it’s how fancy the plumbing system is. Being able to bathe regularly further increased social stratification, as the poor and working class had no choice but to be dirty. More broadly, we westerners tend to view our sit-down toilets as a sign of sophistication and progress, while most of the world still squats over squat-toilets, or outside in the open – this perception seems to be getting more popular globally, though there’s no real basis for it other than cultural preference. Plumbing and sanitation have great impacts on environmental interaction, for good and for bad. Well-designed systems manage waste and keep it from polluting the environment, while some places simply dump massive amounts of waste into rivers and oceans, leading to all kinds of problems. How water is obtained and delivered can also have significant effects. In a time with little-to-no regulation of water and waste, it’s highly likely the human environmental interaction in those days left a lot to be desired, though we aren’t familiar with any particular studies of this. Hope this helps. Hi I have a brass driven ferral with the number 65 imprinted on the side of 90 going into main. It goes brass to lead. What does that mean? I always thought my 1902 bungalow home originally has copper pipes, thanks for letting me know that wasn’t standard until after WWII. Do you know what type of pipes that were used in the early 1900’s? Was it brass, lead, galvanized steel? Hi, Bobby. Chances are the original water piping was either galvanized steel or lead. Cast iron was also widely used, but usually for drain piping. Always love learning about the history of plumbing in the US…having been to areas without it I can say it is for sure something I no longer take for granted….. When we were in Haiti on mission trip and saw the impact of no plumbing services it made us here at http://midwestplumbers.org/ really take our jobs of providing the best plumbing services we can on a daily basis. I found your article to be a gold mine of informatio! However, I am curios about septic tanks and when they came in to use, especially in rural areas, as well as small cities with larger lots, in the northern part of Florida. Any assistance you can provide would be greatly appreciated. It’s interesting that the American people preferred to import their shower systems until the end of the 19th century. The fact that plumbing hadn’t progressed enough for homes to be built with separate bathrooms until the 1850’s is fascinating as well. This makes me wonder if I need to check my bathroom’s plumbing since we live in an older house.